Melton RFC Second XV and their Paviors counterparts met for a rematch, just three weeks after an enthralling high-scoring game between the sides in Nottingham. Melton had won the contest with the last move of the match so everyone was looking forward to a second instalment, and it was more of the same. Paviors were the bigger team, bulked up by Greaves and Clemmons, on loan from Melton, but that did not stop the home side from putting them down in the tackle and frequently winning the breakdown. This gave scrum-half Lennox good ball which he used well to either launch his back line or use his pace to cause havoc in the visitors’ defence. Melton were on the front foot in the scrum where Osbourne, Prior and Davis held the bigger pack, helped by Paul and Chambers in the second row. This allowed the fast back row of Plowman, Conboy, Beesley and Dixon to get in the faces of the opposition attack, always with numbers at the breakdown. The whole backline were quicker than Paviors and reacted by passing into space to meet the runs of team-mates. Morgan-Jones found ground with some great kicks, moving the ball at every opportunity, while Bibby and Franco revelled in the space this created. Bibby employed his direct style, while Franco used his strength to get on the outside and create overlaps to create chances for LJ, at full-back, and the wings Moule and Clarke. Melton did not break clear of Paviors until the final quarter of the match. The hard work they had put in throughout paid off as the opposition tired to allow the home side a couple of tries to take the entertaining game out of reach. Melton: Osbourne, Prior, Davis, Paul, Chambers, Plowman, Dixon, Beesley, Conboy, Lennox, Morgan-Jones, Moule, Franco, Bibby, Clarke, LJ. Tries: LJ (3), Bibby (2), Franco, Moule. 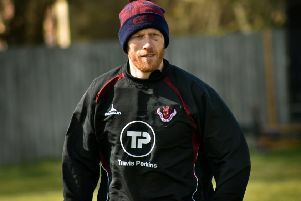 Conversions: Morgan-Jones (4).